About Rafting – What is white water rafting? White water rafting is navigating down an often turbulent riverway by using an inflatable raft for floatation. The turbulence of the river creates aerated peaks and sections of white water to which the sport derives it’s name. The vessel used can vary greatly from a typical inflated boat or raft, to a catamaran style pontoon boat. Using other flotation devices including hard-shell kayaks, inflatable kayaks, and canoes are also typically grouped under the broader term of whitewater rafting, though whitewater kayaking or whitewater canoeing would be more specific. Commercial rafting includes hiring a trained trained river guide to support and lead your river trips. Depending on where you grew up, the words “white water rafting” can create a very different picture in your mind. For residents of the Sacramento region, rafting is often equated with the Class I-II Lower American River float trip from Sunrise Boulevard through Watt Avenue. But aside from two short Class II rapids, the greatest challenge on that section is avoiding floating kegs of beer. This can lead to a distorted viewpoint of the broad range of difficulties and challenges that river rafting can provide. Not understanding the differences between different levels of rivers can make it difficult for participants to understand the value of hiring a professionally trained river guide to help take them down more advanced white water above their natural skill level. So let’s dig deeper into understanding the differences and intricacies of white water rafting. Rafting Classification System – Learn about the six class river difficulty rating system. Discover how you can use the classification scale to gain a better understanding of how one rapid or river compares to another rapid or section of river. 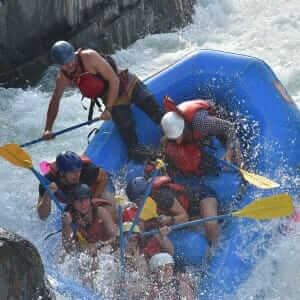 What’s Included with California rafting trips – What does a white water rafting trip with Rock-N-Water include? Accommodations and Facilities – What are the accommodations like? What kind of modern conveniences can I expect while I am there for a California rafting adventure? Comparing outfitters – What sets Rock-N-Water Christian Camps apart from rafting outfitters operating on the American River? Please contact us if you have any questions or want to check on specific availability for you or a group of friends. We’d love to answer any questions that you might have.